Its about time I post about Octobers Stamp of the Month! With only one week left in October, I wouldn’t want you to miss out! This stamp set is pure JOY! Four cute images, in the trendy coloring style, with endless possibilities! I chose to make a christmas card out of this stamp set, but I can see gift tags, scrapbook embellishments, backgrounds, and all sorts of adorable creations with it! *Images outlined in red coordinate with the Cricut® Art Philosophy collection. For my card, I chose the non traditional Peacock and Gold. 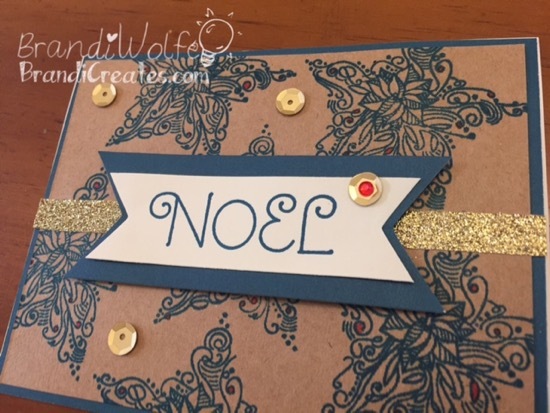 To add a lil sparkle and glisten to the card, I use our Gold Shimmer Trim, Sequence, and with out Shin Han alcohol markers, I colored a few berries, and even colored a clear sparkle to use in the center of a sequence. Theres nothing better than being able to customize your sparkle to fit every project! Here are a few examples of what the CTMH home office has put together! Don’t you just love the gold and red embossed stars!? Get this D-size Stamp of the Month set for just $5 with a minimum qualifying purchase! You can get your stamp set HERE! And remember, add the stamp set to your cart at checkout for the promotional price.